Home » Bi-weekly vs. Semi-monthly – What’s the Difference? It’s kind of confusing to think about, but most things that occur on a bi-weekly basis also occur on a semi-monthly basis. How can this apparent paradox be true? Most months contain three full weeks, as well as enough extra days to bring the total up to 30 or 31 days. The key to this puzzle lies in the meanings of the prefixes semi- and bi-. 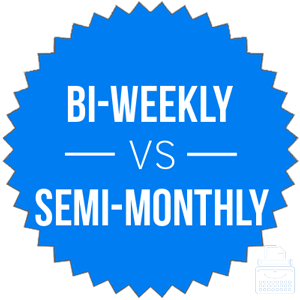 What is the Difference Between Bi-weekly and Semi-monthly? In this post, I will compare semi-monthly vs. bi-weekly. I will use each of these words in a few example sentences to demonstrate how they should appear in context. Plus, I will show you a memory tool that will make choosing semi-monthly or bi-weekly a bit easier. What does bi-weekly mean? The word bi-weekly means once every two weeks. Let’s break this term down into its individual parts. The word weekly is an adverb and adjective that means occurring once in a week. The prefix bi- means two. A bicycle, for instance, has two wheels, and a bicameral legislature (like the one in place in the United States government) has two houses. When you add these parts together, you get an adverb that means occurring every two weeks or every other week. Jermaine always took a peppermint from the counter when he visited the bank to deposit his bi-weekly paycheck. Alex gets a bi-weekly neck trim whether he needs a full haircut or not. Contrary to popular usage, bi-weekly does not mean twice in the same week. So many speakers and writers use the term this way that there is now widespread confusion regarding the true meaning of the term. What does semi-monthly mean? Semi-monthly means every half month or twice a month. Let’s talk about why. Monthly is an adverb or adjective that means occurring once a month. The prefix semi- means half in a literal sense and can also mean partial in a less literal sense. A semicircle is half of a circle. Likewise, semiconscious means halfway or partially conscious. You should check the air pressure in your tires on a semi-monthly basis, if not more frequently. The semi-monthly meetings will continue until the group’s performance returns to baseline. The difference between these two terms is mostly academic. Something that happens every two weeks also happens twice in a month, so bi-weekly and semi-monthly are de facto synonyms. Still, calendar irregularities occasionally occur. If you have a staff meeting every other Wednesday, you will usually have two such meetings per month (i.e., semi-monthly). Every now and then, though, a month might have five Wednesdays and the meeting might fall on the first, third, and fifth Wednesdays. So you should still learn the difference between bi-weekly and semi-monthly. Bi-weekly vs. Semi-monthly Check: Remember that a bicycle has two wheels, and something that happens bi-weekly happens once every two weeks. Also, both of these terms can be written without hyphens: biweekly and semimonthly. Check your office’s in-house style guide to know which spelling to use. Is it bi-weekly or semi-monthly? Most of the time, these terms are interchangeable, but not always. Bi-weekly means every two weeks. Semi-monthly means twice in a month. 1 What is the Difference Between Bi-weekly and Semi-monthly? Laid Out or Layed Out – Which is Correct?